I like Misha as Castiel as well as Future!Cas. I liked Castiel since the first episode Misha appeared onscreen as him. He's family to the boys and has had his great moments as well as bad. 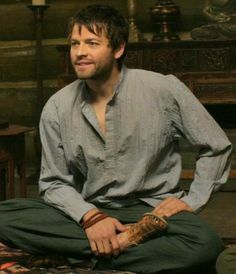 And Future!Cas (hippy Cas) was pretty awesome as well. I'm going to assume the favourite role he played in SPN. I love Cas. It took me a while to get used to him, he had to grow on me, but his plight and his devotion to Dean and his love for humanity just completely won me over once they had a chance to shine through. No other role can top the heart he's put into Cas or replace the love I have for Cas. I also adored Emanuel. That was a true Cas without all his baggage, history and brainwashing. I would've loved to have seen more of him. The car scenes with Dean were so precious. Gah, he looks so young there! I like Castiel too. He hasn't always had the best storylines, but he's a great character!